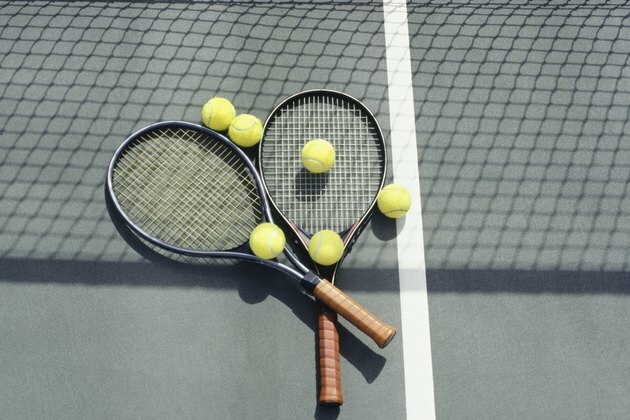 If you think the sport of tennis is the only game that uses a tennis ball, think again. Many entertaining games exist that also use one of these fuzzy, yellow balls. While most games are geared toward younger children who need to develop mobility and hand-eye coordination skills, some can be played by older kids and even young adults who need to be more physically active. Six to eight children of 5 and older can participate in this game, which can be played in a gymnasium or on a tennis court. Set two cones on an end line or baseline, 10 feet apart, to serve as the goal. Place a small piece of tape on the floor or court 10 feet from the endline, and another 20 feet away. These marks should be in line with the middle of the goal. One child starts as goalie and stands between the cones. The other children stand at the 20-foot tape spot. The first child rolls a tennis ball with her racket, and when she gets to the 10-foot tape spot, she pushes the ball hard and shoots the ball toward the goal. The goalie uses his racket to stop the ball. If the shooter gets the ball through the goal, she is the new goalie. The next child in line has a turn at trying to be the goalie, and so on. A good game for improving hand-eye coordination, this catching game works well when played on a flat, grassy area with a group of 20 players. Have everyone spread out. When the players are all set, hit a ball high into the air with a racket and yell out a number; that is the number of points the ball is worth. The player who catches the ball wins the points. However, if he fumbles the ball and fails to catch it, he loses that many points. Play continues until a player has accumulated 100 points. This game can be played with 15 to 20 children who must be able to throw and catch a ball. Have everyone form a large circle with at least 3 or 4 feet between them. One child is "It," and stands in the middle of the circle. While a tennis ball is thrown around the circle from one player to another, the player in the middle tries to intercept the ball. If he does, he switches place with the player who threw the ball and this player is now the new "It." Wall ball is a fast-paced game for ages 12 and up. It can be played one-on-one or with teams of two or three players. Wall ball rules vary, but basically you must throw the ball against a wall and catch it after one bounce or in the air. If you throw the ball and it hits the ground before hitting the wall, if the other player or team catches the ball in the air after it bounces off the wall or you fumble the ball when trying to catch it, you must run and touch the wall before the other player or team throws the ball. If you don't touch the wall before the ball does, the other player or team wins a point. Continue the game until one player or team has 15 points.